Say goodbye to puny supermarket Pork Sausage Links only slightly bigger than your pinkie finger. 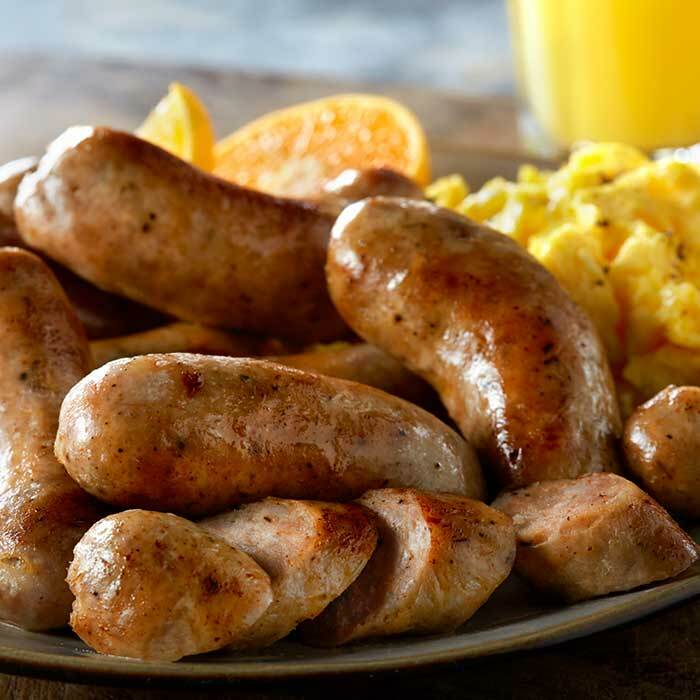 Our Fresh Sausage Links contain only the freshest premium pork, natural sage and a few special seasonings - no cereals or fillers, no rubbery texture. Simply real good, old-fashioned pork sausage made with the same family recipe from the 1930s. The links are generously sized at 4" long and nearly 1" thick. They are flash frozen to seal in their distinctive, rich flavors. 3 (1 lb.) pkgs. Sausage Links, approx. 24 links. Arrives frozen. NOTE: Because these sausages are produced in a separate facility from ours, which burned in the January 2016 fire, returning customers may experience a slightly different flavor profile than what they're used to. However, we still honor our 100% Satisfaction Guarantee. Thank you for your consideration as the recovery process continues. Ingredients: Pork, Salt, Flavoring, Sugar. Storage: Arrives frozen. Refrigerate upon receipt. If you are in a hurry to thaw the product, use your microwave following the directions of the microwave manufacturer. Most microwaves have a defrost mode based on the pounds needed to thaw. Preparation Cooking is required. Fry, broil, or grill. We prefer to cook in frying pan over medium-high heat until brown on both sides. Make sure sausage is fully cooked. Internal temperature should be 160 degrees F.